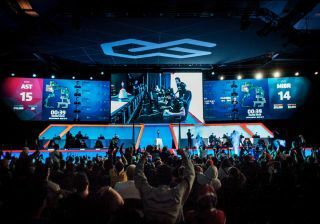 The city of Arlington, Texas, has chosen Canon's 4K lenses to outfit its broadcast cameras at the Esports Stadium Arlington – a $10 million facility that hosts professional esports competition. The stadium selected a raft of Canon's broadcast lenses for its Grass Valley 4K cameras: three Canon UHD-DIGISUPER 66 4K UHD field box lenses, four CJ24ex7.5B 4K UHD telephoto zoom lenses and one CJ14ex4.3B 4K UHD wide angle zoom lens. The lenses will accommodate both existing HDTV broadcasts and the shift to 4K production. “Canon’s ability to supply lenses that met our 4K visual needs, budget constraints, support and time requirements helped us succeed in building this industry changing facility,” said Corey Dunn of NGAGE Esports, which oversaw operations and production for the stadium. The equipment will power the broadcast capabilities of the 100,000 square-foot facility, the biggest in the United States, which hosts up to 2,500 spectators in Dallas-Fort Worth. Esports is now a very big business, with the industry expected to generate $1.65 billion in revenue by next year.